So, you’re trying to decide which content management system (CMS) to use for your website? You’ve come to the right place! If you’ve done a Google search, you’ve probably been bombarded by the large number of CMS saying they are the best platform to use. Honestly, the number of choices can be overwhelming. But we’re just going to come out and say it—using WordPress is kind of a no-brainer. There’s a reason why 29% of the web uses it! Actually, there are a few reasons. As a digital marketing company, Webster Digital Marketing uses a variety of CMS as most of our clients come to us with what they’ve already got. We do everything from creating new websites, writing website content and blogs, to increasing site’s search engine optimization (SEO) and so much more. Yet, we still stick with our decision. So what makes WordPress superior? Let’s dive in. WordPress offers themes that make sites easy to design without any prior knowledge of website design. Every theme is different, but there is basically a theme for every type of website, whether it’s for business, blogging, or an online store. You can change colors and fonts to match your brand and upload your logo without having to write any code. This also means that if in the future your company goes through a brand redesign, you can easily modify your website. Adding new content, changing content, and uploading images and files are all very easy with WordPress. WordPress uses a web-based editor that makes it easy to make changes and see the results of those changes right away. If you can use Microsoft Word, you can use WordPress! Even tasks like embedding YouTube videos or linking between pages are easy to accomplish. 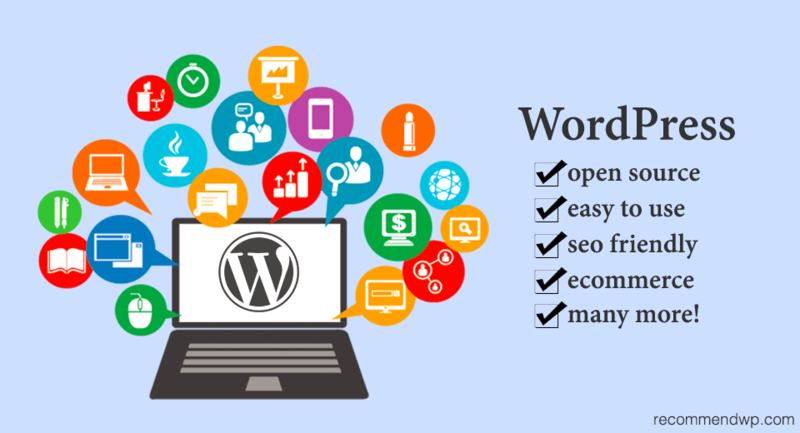 And, because WordPress is used so extensively on the web, there are no shortage of articles and videos online to help you through the process. WordPress makes sure your website is safe and secure. While there can still be threats to your website, WordPress offers plugins to maximize your security, prevent spam, and prevent malware. This is a huge one. SEO can bring you a lot of business to your website, so you want to have a site that Google and other search engines love. By design, WordPress is SEO friendly out of the gate. Additionally, SEO plugins can further optimize your website, which we highly recommend. For us, it means making SEO changes quickly and efficiently, which for our clients, only helps them rank higher on search engines. Often times you are stuck with whatever hosting is provided, meaning you can’t choose the hosting provider that has the best value or preforms higher. Adjusting code is limited. Even worse, sometimes you can get stuck with a completely unique coding language. This can present a lot of challenges to you or your developer when you need to make changes that you can’t through the editor. Online advertising tracking is not always possible. Tracking online advertising requires adding pieces of code to certain pages of a website. Not all CMS solutions allow this, but WordPress has a variety of plugins to add this functionality. You don’t technically have full ownership of your site and content. You’re essentially renting the website from these companies, so if you stop paying, all your files and pages are either lost or withheld by the company. With WordPress, you own all the files, and no one can prevent you from moving them to another host. WordPress rocks, plain and simple. There is a reason it has such a strong following all over the world. For businesses and ecommerce sites, WordPress provides you with a customizable site that is SEO friendly. On top of that, you get great advantages like plugins, themes, free tools, and full media support. So if you’ve been trying to decide whether or not to use WordPress for your website, we hope we’ve helped you make the right decision. If you need help building your website, deciding on the right plugins or really making your site perform well on search engines, let us know. Webster Digital Marketing would be happy to help. So, what are you waiting for? Contact us today.